Well, this is what lies on the surface - the obvious differences. However, Naver is also different from Google in a much more profound and intricate way. Naver: the leader or the follower? According to Matt Cutts who not long ago paid a visit to South Korea where he spoke to the country's high-ranking officials and the press, Naver does not give Korean websites the exposure they deserve. That's because many Korean webmasters block Google and other global search engines from accessing their sites, for security reasons. And that, says Mr. Cutts, is a dangerous course: "If a country turns away from the open Web, it risks turning into an island". However, allow me to disagree with Mr. Cutts and show why Korean sites do not really have to become part of the Google-dominated "open" Web. In 2002, Naver introduced Knowledge In, which was effectively the forerunner of Yahoo! Answers. The Knowledge In Q &A database is still hugely popular with the users. 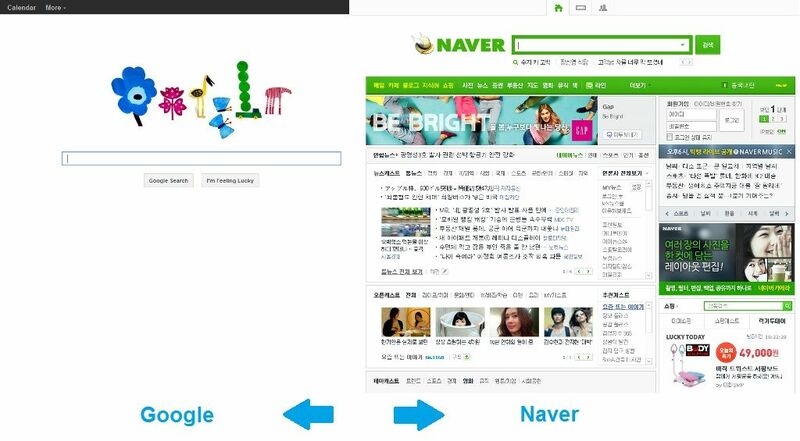 Naver began providing different types of search results long before Google's Universal Search appeared. Naver has been more of a social search engine right from the start, while Google is still getting there. Naver's me.naver.com existed long before Google came up with its Search Plus My World (SPYW). "Naver's forte is in aggregating useful information for popular topics, often created by the users themselves (blogs and Q&A searches), and presenting such information in a very human-friendly way (heard "universal search"?). Unlike Google, Naver doesn't rely almost entirely on the brute force performance of its search algorithm." So, basically, Naver is Yahoo! Answers, Blogger, YouTube and Google's paid search combined. Searchers look for necessary information by browsing different types of Naver's search results, such as the Q &A database, News search, Blog search, etc. One important thing to bear on mind is that Naver's search algorithm is built around the Korean language, which helps Naver deliver more relevant results than Google on many occasions, since Korean syntax is quite different from that of the English language. For example, let's search for 이브닝 가운 (evening gown) on Naver.com and on Google.co.kr. We can see that Naver returns 3 Knowledge encyclopedia results, 5 News results, 5 Professional information results (PDF docs), 3 Video results and 5 Image results on its front page. You may say that this is because Google is not allowed to index many of those sites. That may be, but I'm more inclined to think that it's just that Naver is more familiar with the specifics of the Korean Web and the language, and, therefore, provides better results. The main argument against Naver is that it's not as good as Google at crawling and indexing. Well, you know what - it doesn't have to be. And this is the ultimate reason why Google is so pissed. A lot of Korean webmasters are not worried about privacy issues, since they know that Naver is not going to index certain information. So, to avoid security breaches, they simply block Google bot from crawling their sites. But why is that Naver does not need such amazing indexing abilities? Let us see. If we take the number of indexed sites per user in Naver, it will definitely be smaller than the number of indexed sites per user in Google. But the quality of those sites is way better (perhaps, with the exception of the non-social part of organic search results). Naver prefers to have less stuff in its index, but to make sure that stuff is real. That's why it gives priority to paid listing, directory submissions, user generated content, Web 2.0 properties, etc. You can compare Naver to a foodie who is picky about what he/she's getting, while Google seems to be OK even with junk food. It'll then just try to push it to the bottom of the pile. Korean webmasters are well aware of that, and none of them really expects much traffic from Naver's non-social, organic listings. Hence, if you look at those listings you'll feel like they've crept out of 1999 – they are mostly spam. At the same time, Naver provides one with a dazzling variety of all sorts of other search results that seem just as relevant as Google's. So, in this light, Google's plea to Korea to "show itself on the Web" sound all the more hypocritical (well, tell me something new). What does Google do then? What Google is trying to do with all this is lay its hands on as much Korean content as it can. To achieve this, it has to persuade Korean webmasters and business people that they NEED to optimize for Google ("Don't be an island", says Google). Because, if this does not happen, Google will never be able to provide the yummy kind of search results that Naver delivers, and they know it at Google. And the problem for Google is that most Korean Internet folks seem to be pretty comfortable with Naver. Of course, Korea is visible on the Web. But it's visible through a unique Naver's lens that Google is simply unable to mimic. So, it's trying to trick Korea into playing according to its rules, which is just so... Google. To a Naver advertiser who gets traffic from paid search, it does not really matter whether they are going to pay an SEO agency or Naver to drive traffic to their site. As for certain sites that could go international by getting listed on Google... Again, this is another invalid argument that Google is using. A Korean site that's IN Korean and is designed FOR Korean audiences has little potential of going big on the international arena anyway. You'd need a totally different site for that. You may ask then, does Korean SEO even exist? Well, it does not exist in the form it appears in, say, the United States. Each segment of Naver search (Knowledge In search, Blog and Cafes search, News search, etc.) has its own algorithm. So, there is no one-size-fits-all optimization recipe. It is rather a mixture of pay-per-click and pay-per-time advertising, coupled with the promotion in Knowledge In, blogs and cafés (essentially, multi-media blogs), News, Images, Videos and other types of results - voila, we get a picture of the Korean SEO. To sum it up, I'd like to say that, to me, the Korean search industry is doing just fine and Google's ambitions are just Google's ambitions, no matter how hard it tries to present them as a sincere concern about Korea turning into an island. Looking to advertise on Naver? Here's how - Search Marketing Guide to Naver, Korea's Most Popular Search Engine .